Background: Adiantum philippense (AP) is a pteridophyte that shows antihyperglycemic activity in vivo diabetic model, but the mechanism of action is unknown. Objective: AP was found to play a pivotal role in minimizing the high blood glucose in alloxan-induced diabetic rats. Simultaneously, it was observed that it could maintain the normal lipid profile even in diabetic condition. To investigate its insulin-like activity along with its inhibitory role on adipocyte differentiation became the objective of our present study. Materials and Methods: Glucose uptake potential of this fern was done in isolated pancreatic islets and inhibition of adipocyte differentiation was assessed in 3T3-L1 cell line. Before this, the cytotoxic concentration was determined by 3-(4,5-dimethylthiazol-2-yl)-2,5-diphenyltetrazolium bromide assay on L929 cell line. To determine its role in lipid metabolism, the oil droplets produced in adipocytes were stained with Oil 'O' red staining, and triglyceride levels of various drug treatments were measured spectrophotometrically. Results: This fern extract was found to be actively utilizing glucose in the glucose uptake assay. Moreover, it was also involved in inhibiting differentiation of pro-adipocyte to adipocyte in the 3T3-L1 cell lines. The percentage inhibition as obtained from the absorbance showed that the ethanolic extract at the concentration of 200 μg/ml showed 32.48% inhibition. Conclusion: All the above-mentioned parameters when appraised indicated that this fern could be used as an alternative medicine in managing diabetes associated with obesity. Abbreviations used: AP: Adiantum phillipense; MTT: (3-(4,5- Dimethylthiazol-2-yl)-2,5-Diphenyltetrazolium Bromide); BSA: Bovine serum albumin; FCS: Fetal calf serum; DMEM: Dulbecco's minimum essential media; RPMI: Roswell park memorial institute medium; DTZ: Dithizone; TG: Triglyceride; PPARγ: Peroxisome proliferator-activated receptor gamma; IBMX: 3-isobutyl-1-methylxanthine; nm: Nanometer; GI: Growth Inhibition; ELISA: Enzyme linked immunosorbent assay. Adiantum phillippense (AP) is a pteridophyte that can work as antihyperglycemic agent by minimizing some adverse effects produced by diabetes. Diabetes produces oxidative stress, hampers normal glucose uptake in the pancreas, promotes adipocyte differentiation, and leads to obesity, and as a result, it generates catastrophic effect to the normal cells. The present study has shown that ethanolic extract of AP gives better protection rate against H2O2-induced cytotoxicity, elicits insulinotropic activity in isolated mouse pancreatic glucose uptake assay. It also inhibits the preadipocytes to become mature adipocytes judged by morphology or lipid-specific Oil-Red-O staining of 3T3-L1 cell line. Modern medicine which reduces blood glucose in hyperglycemia contributes to weight gain which is not desirable. Type 2 diabetes is often associated with obesity in a way that excessive adipogenecity contributes to and increases insulin resistance. Moreover, diabetes and obesity causes substantial morbidity, mortality, and leads to long-term complication. Thus, to provide an herbal drug to lower hyperglycemia and to avoid adipogenesis, we initiated our efforts toward evaluating the role of Adiantum philippense (AP) on two different aspects. The first aspect was to focus on its insulin-like activity on isolated pancreatic islet cells which led to increase glucose uptake in vitro. The second was to monitor if it could inhibit pro-adipocyte differentiation, i.e., 3T3-L1 cell line to differentiate into lipid-laden mature adipocytes. Polyphenols and flavonoids isolated or derived from plants have been used to treat various disease such as diabetes, aging, and prevention of cardiovascular disease. AP which is commonly known as walking maidenhair fern is a cosmopolitan pteridophyte. This vascular fern, AP is reported to have antimicrobial activity, antitumor activity, platelet aggregation, anti-inflammatory action  as well as hypotensive, antiviral, and antibacterial activity. Ethnomedicinally, the whole plant is made into paste and used for healing of wounds. Collagenase Type V, soyabean trypsin inhibitor, bovine serum albumin (BSA), Dulbecco's modified Eagle's medium (DMEM), 10% fetal calf serum (FCS), RPMI 1640. All these chemicals were procured from Sigma-Aldrich, St. Louis, USA, and other chemicals used were of analytical grade. The fern AP was collected from Chandraprabha Vanrai, Dapoli in the Ratnagiri district of Maharashtra in the end of monsoon and was authenticated by Dr. P.G Diwakar from Botanical Survey of India, Pune, under the number BSI/WC/Tech./2011/306. A voucher specimen of the herbarium was submitted in APT Research Foundation, Pune. The fronds were cleaned and shade dried in a dryer, and the dried fronds obtained were powdered. It was then extracted in Soxhlet apparatus with water and ethanol. The aqueous as well as ethanolic extracts obtained were concentrated in rotary evaporator under vacuum, and their percent yields were determined. Pancreatic islet cells were isolated from mice following the procedure given by Shewade et al., 1999. In brief, two mice were sacrificed by cervical dislocation, and pancreas was excised from adhered spleen and duodenum aseptically. Pieces of pancreas were then immersed in dissociation media for 10 min containing DMEM supplemented with 1 mg/ml collagenase Type V (Sigma), 2 mg/ml soybean trypsin inhibitor (Sigma), and 2% BSA fraction V (Sigma). After dissociation, it was centrifuged and pellets with sufficient amount of supernatants were separated and seeded in culture flasks containing RPMI 1640 with 10% FCS. After 48 h of incubation, intact islets of diameter ≥100 μm were handpicked, counted, and used for viability assay and glucose uptake assay. Islet viability was assessed by trypan blue dye exclusion test, and specificity of islets was determined by dithizone (DTZ) staining. The stained islets were then counted under inverted microscope. At the end of 48 h, 15 μl of the media containing approximately 10 viable islets were handpicked and placed in 96-well plate. The islets were preincubated with 5 μl/well (100 μg) of ethanolic and aqueous extract of AP for 30 min at 37°C. These islets were then stressed with 100 μl of 0.5, 1, 5, and 10 mM H2O2 in RPMI for 30 min. After completion of 30 min, viability of these islets was checked by trypan blue staining. The method described by van de Venter et al., 2008 was adopted to determine the glucose uptake in pancreatic cells. Briefly, in a 96-well plate, 15 μl of 48 h cultured pancreatic islet cells containing approximately 10 islets were put. It was followed by incubation of the islets at 37°C for 15 min with 10 μl of various treatments of extracts, insulin, glibenclamide, and quercetin at a concentration of 1 mg/ml. The control wells were devoid of treatment. Then, each well was treated with 75 μl of 8 mM glucose in RPMI 1640 supplemented with 10% FCS and BSA. After incubation, 15 μl of the supernatant was taken at an interval of ½, 1, and 2 h with a micropipette, and glucose was estimated by glucose oxidase/peroxidase method  in biochemistry analyzer and percent difference calculated. This is a colorimetric assay that measures the reduction of yellow 3-(4,5-dimethylthiazol-2-yl)-2,5-diphenyltetrazolium bromide (MTT) by mitochondrial succinate dehydrogenase. The MTT enters the cells and passes into the mitochondria where it is reduced to an insoluble, colored (dark purple) formazan product. This assay directly assesses cell viability and requires only a small amount of test sample. The cells are then solubilized with isopropanol, and the released solubilized formazan is measured spectrophotometrically. Since the reduction of MTT can occur in metabolically active cells the level of activity is a measure of the viability of the cells. In short, L929 fibroblastic cells were seeded in the 96-well plate and permitted to adhere for 24 h at 37°C in an incubator. Four concentrations of 100, 200, 400, and 1000 μg/ml was prepared by dissolving the extract in the medium and incubated for 48 h. After completion of 48 h, 10 μl of MTT (5 mg/ml) was added and percentage of dead cells by taking absorbance in an ELISA plate reader at 570 nm. The percentage growth inhibition (GI) was calculated using the formula given below. % GI = (100 − absorbance [sample]/absorbance [control] × 100). Adipocyte differentiation assay was carried out following the protocol given by Kalekar et al. Briefly, 3T3-L1 cells were grown in DMEM and 5 × 103 cells were seeded into 24-well plate. After 48 h, the culture medium was replaced with induction media containing dexamethasone, IBMX, and insulin. The wells were allowed to incubate for 2 more days followed by addition of test extracts at a concentration of 100 μg and 200 μg per well. Standard cerulenin was used at a concentration of 10 μg/well, respectively. After 24 h, wells were observed under inverted microscope for oil droplets. The media was replaced with DMEM + 10% FBS for 5 more days. At the end of 5 days, 100 μl of the supernatant was tested for triglyceride (TG) on biochemistry analyzer using Standard kit. Later, medium was removed, and formalin was added for fixation. Once fixed the wells were washed thrice with isopropanol and allowed to dry. The dried wells containing fixed oil droplets were stained with Oil 'O' red. It was followed by destaining the wells by washing thrice with distilled water. Finally, 1 ml of 100% isopropanol was added, mixed properly, and absorbance was read at 520 nm in a spectrophotometer. In the given condition only pancreatic islets survive, and surrounding acinar cells gradually die. The islets appear as follows shown in [Figure 1]. The trypan blue staining indicated 90% viability whereas DTZ staining showed the specificity and identity of the pancreatic islets. In the present study, the untreated normal pancreatic islets when treated with 0.5 mM H2O2 showed 63.33% viability of islets while at 10 mM concentration, it was reduced to 13.33%. The aqueous and ethanolic extracts of AP have shown 73.33% and 76.66% viability, respectively, at 0.5 mM concentration of H2O2. However, at 10 mM concentration of H2O2, the aqueous and the ethanolic extracts have shown 33.33 and 43.33% viability [Figure 2]. The glucose uptake assay of the pancreatic islets was carried out by treating approximately 10 islets with various treatments such as extracts of AP, insulin, standard drug glibenclamide, and standard flavonoid quercetin. All the experiments were carried out in triplicates (n = 3) [Figure 3]. Out of the four concentrations used, 1000 μg/ml was found to be most toxic as it produced 40% viability. The lower concentration of 100 μg produced 92% viability, the 200 μg produced 87% viability, and 400 μg produced 79% viability, respectively [Figure 4]. In the adipocyte differentiation assay, the oil droplets were stained with Oil 'O' red, and their absorbance was measured at 520 nm. The percent inhibition as obtained from the absorbance showed that the ethanolic extract at the concentration of 100 μg/ml showed 21.22% inhibition. While the same extract at 200 μg/ml concentration showed 32.48% inhibition of adipocyte differentiation. The standard cerulenin, however, showed 55.92% inhibition of adipocyte differentiation at 10 μg/ml concentration [Figure 5]. The TG levels were measured from the supernatants of the ethanolic extract of AP at 100 and 200 μg/ml and compared with standard drug, cerulenin and induction control wells [Table 1]. The TG accumulation in 3T3-L1 adipocytes was found to be decreased in the ethanolic extract treated wells at both concentrations of 100 and 200 μg/ml respectively. The results were comparable with standard drug cerulenin at a concentration of 10 μg/ml. The positive control wells, however, showed elevated levels of TG indicating increased differentiation of 3T3-L1 pro-adipocytes to adipocyte and TG synthesis. Herbal drug that possesses hypoglycemic activity should have insulin-sensitizing action to improve insulin secretion, protect pancreatic beta cell survival, and relieve insulin resistance. Insulin suppresses lipolysis through the activation of its downstream kinase, AKT, resulting in the inhibition of protein kinase A, the main positive effector of lipolysis. During insulin resistance, this process is ineffective, leading to a characteristic dyslipidemia, and the worsening of impaired insulin action and obesity. Therefore, it is virtually impossible to reduce body fat levels with elevated blood sugar levels. Earlier we reported that AP effectively lowered hyperglycemia and maintained normal lipid profile. To further evaluate its insulinotropic effects, in vitro glucose uptake assay was performed in isolated pancreatic islets. Before glucose uptake assay, the pancreatic islets were stressed with H2O2 which is known as a potent oxidative damaging agent. 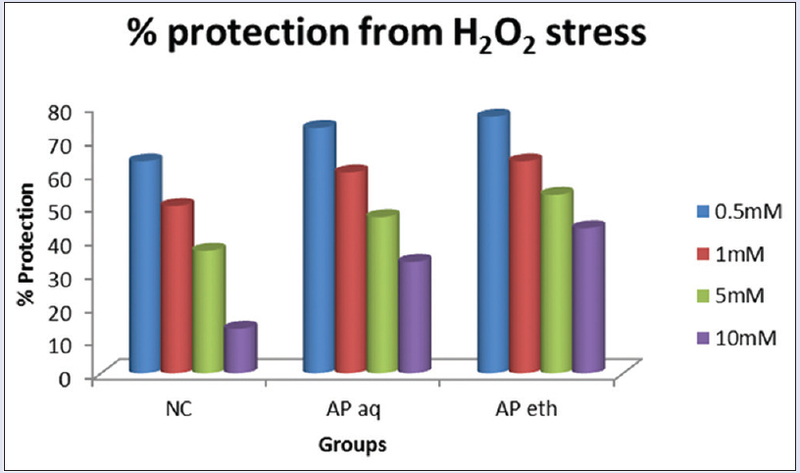 From the results, it is evident that the ethanolic extract showed better protection rate against H2O2-induced cytotoxicity. In the glucose uptake assay, at 1 h interval, both the aqueous and ethanolic extract of AP was found to increase the glucose uptake capacity of the pancreatic islets by 6.01% and 10.06% while the insulin and glibenclamide have shown 7% and 4% glucose uptake, respectively. The standard flavonoid, quercetin have also shown 5% glucose uptake. At 2 h interval, the glucose uptake became 28.62% in the ethanolic extract treated islets which was higher than islets treated with aqueous extract (12.86%), glibenclamide (5.67%), and quercetin (6.66%). 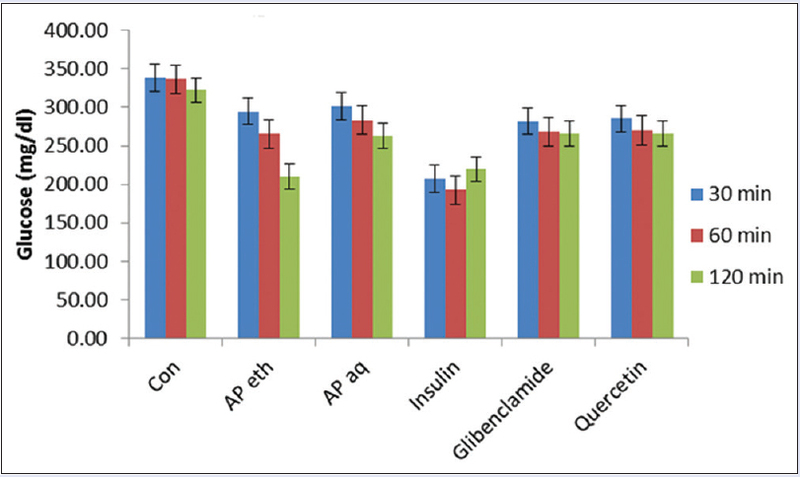 The effect of insulin on pancreatic islets, however, was not observed as there was a rise in the glucose concentration at the end of 2 h.
As the ethanolic extract was found to be more effective than aqueous extract of AP in the glucose uptake assay, further studies on adipocyte differentiation assay were carried out with ethanolic extract. However, it was necessary to determine the concentration of the ethanolic extract that can be used for adipocyte differentiation, for which the cytotoxic concentration was determined by MTT assay. Owing to the toxicity to L929 cell lines by 1000 and 400 μg/ml concentration [Figure 4], lower doses were considered for adipocyte differentiation assay. Hypertriglyceridemia is a common lipid abnormality in persons with visceral obesity, metabolic syndrome, and type 2 diabetes. Preadipocyte when incubated with the standard cerulenin along with differentiation inducers, showed decreased adipocyte differentiation rate and reduced TG accumulation. 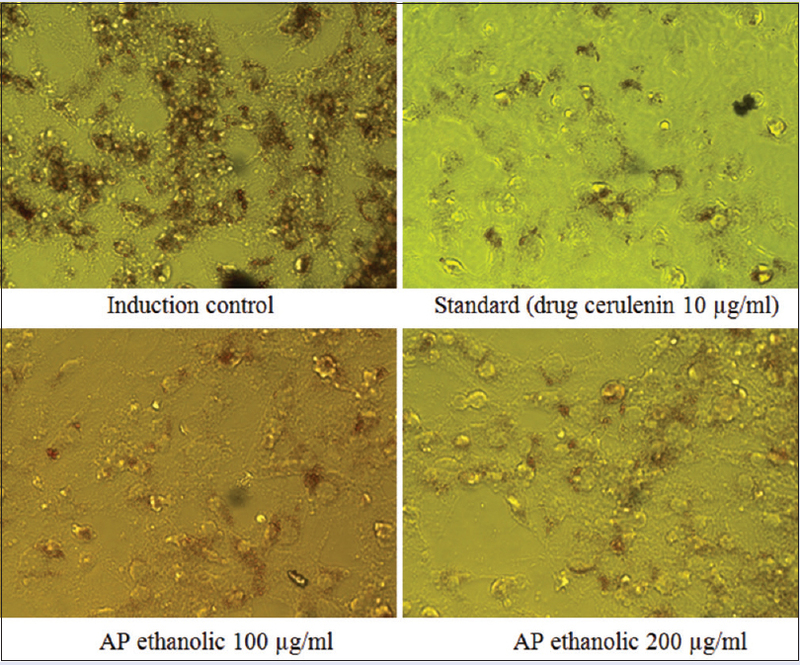 Simultaneously, AP ethanolic extract showed inhibition of adipocyte differentiation in a dose-dependent manner. The TG levels were also low as compared to the induction control. Adipocytes are the sites for storing triacylglycerol and releasing free fatty acid in response to changes in energy demands. Excessive differentiation and growth of adipocytes leads to increased fat cell mass and number, adipogenesis including structural changes, lipid accumulation and lipogenic enzyme expression, and surplus energy accumulation stored as TG in adipocytes. Thus, our in vitro results showed that AP increases glucose uptake in pancreatic beta cell as well as inhibit the preadipocytes to become mature adipocytes judged by their morphology or lipid-specific Oil-Red-O staining. The probable mechanism of action involved in the inhibition of adipocyte differentiation may be due to decreased activity of peroxisome proliferator-activated receptor gamma (PPARγ) expression. As PPARγ/regulating activity are targets for the development of therapeutics for the treatment of obesity and type 2 diabetes, this plant might be desirable in type 2 diabetic obese patients. It is also suggested by Lee and Sung, 2016 that phytochemicals isolated from natural plant source produce anti-adipogenic activity which highlight its potential in the prevention and treatment of obesity. Thus, analyzing all the above parameters, it can be assumed that pteridophytes like AP could be used as an alternative medicine in managing diabetes associated with obesity. Although primitive in nature, these plants contain certain phytochemicals which can be isolated in pure form in the near future. The authors are thankful to Mrs. Shubhangi Paygude and other staff of APT Research Foundation, National Toxicology Centre, Pune, for their technical help during the experiments. Klein G, Kim J, Himmeldirk K, Cao Y, Chen X. Antidiabetes and anti-obesity activity of Lagerstroemia speciosa . Evid Based Complement Alternat Med 2007;4:401-7. McGarry JD. What if Minkowski had been ageusic? An alternative angle on diabetes. Science 1992;258:766-70. Krisanapun C, Lee SH, Peungvicha P, Temsiririrkkul R, Baek SJ. 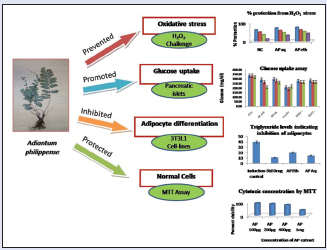 Antidiabetic activities of Abutilon indicum (L.) sweet are mediated by enhancement of adipocyte differentiation and activation of the GLUT1 promoter. Evid Based Complement Alternat Med 2011;2011:167684. Tamboli FA, More HN. Evaluation of antiulcer and antioxidant activity of Barleria gibsoni Dalz. leaves. Pharmacognosy Res 2016-Dec;8:226-230. 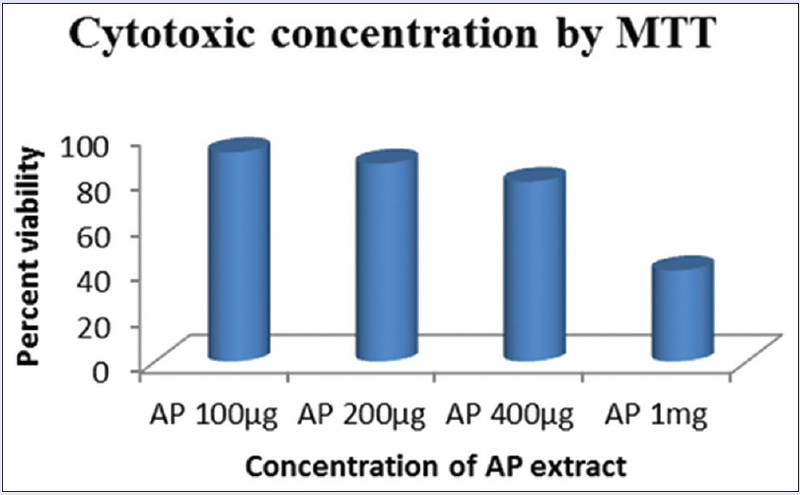 Guha P, Mukhopadhyay R, Gupta K. Antifungal activity of the crude extracts and extracted phenols from gametophytes and sporophytes of two species of Adiantum . Taiwania 2005;50:272-83. Pallavi G, Gupta VK, Chate VA. An ethno-pharmaco-botanical review of hamsapadi – Adiantum lunulatum Burm. f. (A. philippense Linn.). Int J Pharma Biol Arch 2011;2:1627-35. Reddy VL, Ravikanth V, Rao TP, Diwan PV, Venkateswarlu Y. A new triterpenoid from the fern Adiantum lunulatum and evaluation of antibacterial activity. Phytochemistry 2001;56:173-5. Benjamin A, Manickam VS. Medicinal pteridophytes from the Western Ghats. Indian J Tradit Knowl 2006;6:611-18. Shewade YM, Umrani M, Bhonde RR. Large-scale isolation of islets by tissue culture of adult mouse pancreas. Transplant Proc 1999;31:1721-3. Modak MA, Parab PB, Ghaskadbi SS. Pancreatic islets are very poor in rectifying oxidative DNA damage. Pancreas 2009;38:23-9.
van de Venter M, Roux S, Bungu LC, Louw J, Crouch NR, Grace OM, et al. Antidiabetic screening and scoring of 11 plants traditionally used in South Africa. J Ethnopharmacol 2008;119:81-6. Trinder P. Determination of glucose in blood using glucose oxidase with an alternative oxygen acceptor. Ann Clin Biochem 1969;6:24-5. Belinelo VJ, Campos MT, Antunes RM, Assenco R, Filho SV, Lanna M, et al . Insignificant level of in vitro cytotoxicity, anti-rotavirus, antibacterial, and antifungal activities of N-alkylmaleamic acids. J Pharm Negat Results 2013;4:19-25. Majumdar M, Ratho R, Chawla Y, Singh MP. Evaluation of antigenicity and cell mediated immunity of hepatitis E virus patients: Using non radioactive MTT assay. Indian J Med Microbiol 2013;31:64-8. Patel S, Gheewala N, Suthar A, Shah A. In-vitro cytotoxicity activity of Solanum nigrum extract against HeLa cell line and vero cell line. Int J Pharm Pharm Sci 2009;1:38-46. Dantu AS, Shankarguru P, Ramya DD, Vedhahari BN. Evaluation of in vitro anticancer activity of hydroalcoholic extract of Tabernaemontana divaricata . Asian J Pharm Clin Res 2012;5:59-61. Kalekar S, Karve A, Munshi R, Bhalerao S. Evaluation of the adipogenic potential and glucose uptake stimulatory activity of Phyllanthus emblica and Tinospora cordifolia : An in vitro study. Int J Pharm Biol Sci 2012;3:230-6. Klemm DJ, Leitner JW, Watson P, Nesterova A, Reusch JE, Goalstone ML, et al. Insulin-induced adipocyte differentiation. Activation of CREB rescues adipogenesis from the arrest caused by inhibition of prenylation. J Biol Chem 2001;276:28430-5. Ko BS, Choi SB, Park SK, Jang JS, Kim YE, Park S. Insulin sensitizing and insulinotropic action of berberine from Cortidis rhizoma. Biol Pharm Bull 2005;28:1431-7. Choi SM, Tucker DF, Gross DN, Easton RM, DiPilato LM, Dean AS, et al . Insulin regulates adipocyte lipolysis via an Akt-independent signaling pathway. Mol Cell Biol 2010;30:5009-20. Paul T, Das B, Apte KG, Banerjee S, Saxena RC. Evaluation of anti-hyperglycemic activity of Adiantum philippense Linn, a pteridophyte in alloxan induced diabetic rats. J Diabetes Metab 2012;3:1-8. Subramanium S, Chait A. Hypertriglyceridemia secondary to obesity and diabetes. Biochim Biophys Acta Mol Cell Biol Lipids 2012;1821:819-25. Kim HK, Della-Fera M, Lin J, Baile CA. Docosahexaenoic acid inhibits adipocyte differentiation and induces apoptosis in 3T3-L1 preadipocytes. J Nutr 2006;136:2965-9. Kang JW, Nam D, Kim KH, Huh JE, Lee JD. Effect of gambisan on the inhibition of adipogenesis in 3T3-L1 adipocytes. Evid Based Complement Alternat Med 2013;2013:789067. Farmer SR. Regulation of PPARgamma activity during adipogenesis. Int J Obes (Lond) 2005;29 Suppl 1:S13-6. Lee M, Sung SH. Platyphylloside isolated from Betula platyphylla inhibit adipocyte differentiation and induce lipolysis via regulating adipokines including PPARγ in 3T3-L1 Cells. Pharmacogn Mag 2016;12:276-81.